Bring your lawn chair, plenty of cold drinks and snacks. ​The southern charm and New York City grit of Babs Winn and her sophisticated blend of country, rockabilly, swing, and blues get the crowd on its feet. Country music fans of all ages, love the show. 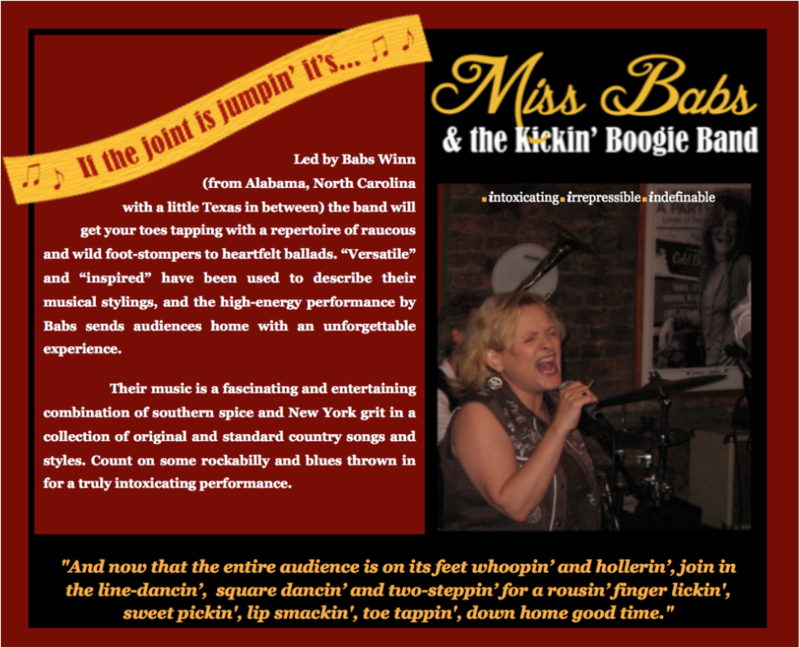 Well known on the New York country music, club and event circuit, MISS BABS & the Kickin’ Boogie Band can ignite a room and create a frenzy on the dance floor. Basic Line and Square Dance lessons are expertly taught by Miss Babs, herself, if requested. As MISS BABS & the Kickin’ Boogie Band are located in New York City, local country music lovers get the opportunity to see this high-powered, foot stompin’, country, rockabilly and blues band in person. Come on down and kick up your heels with some big city style two-steppin’ and line-dancin'. North Hempstead Beach Park in its 34 Acres offers many amenities for their visitors. Formally known as Bar Beach & Hempstead Harbor Parks, the beach includes a fishing pier, boat ramp, bathhouse, and concession stand. © COPYRIGHT 2015 by Babs Winn Enterprises. ALL RIGHTS RESERVED.